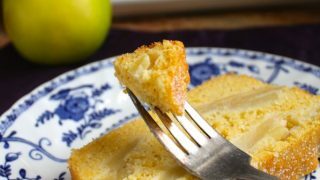 This Cornbread Apple Loaf is surprisingly good! Why? 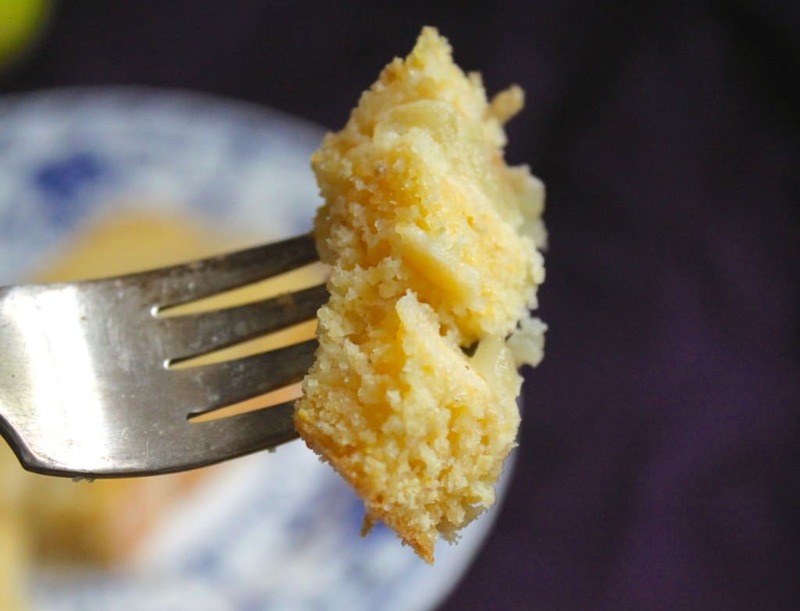 Because it contains an unexpected combination of apples with cornbread. Based on an Italian apple cake, it makes a wonderful snack or lunchbox treat. 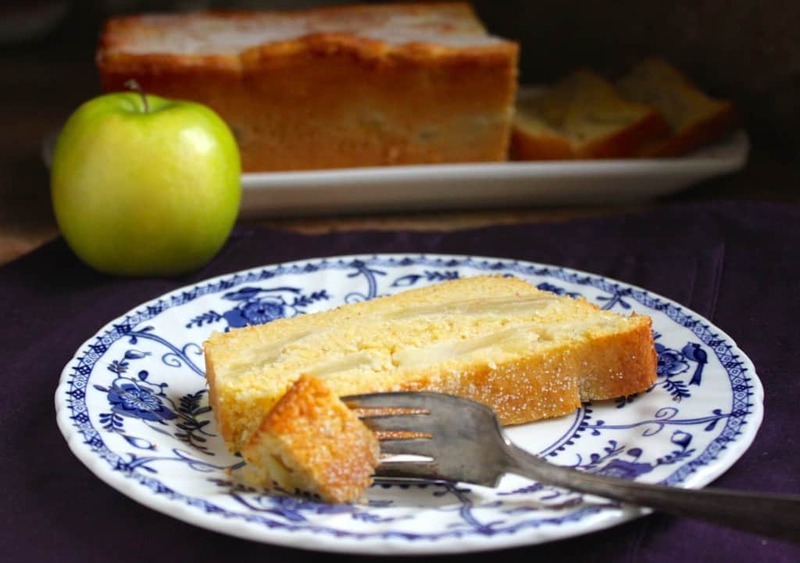 I first saw the original recipe for this cake in an old copy of David Rosengarten’s Report, and he described it as a quick version of an Northern Italian Friuli Apple Cake. WHEAT FLOUR, DEGERMINATED YELLOW CORN MEAL, SUGAR, ANIMAL SHORTENING (CONTAINS ONE OR MORE OF THE FOLLOWING: LARD, HYDROGENATED LARD, PARTIALLY HYDROGENATED LARD), CONTAINS LESS THAN 2% OF EACH OF THE FOLLOWING: BAKING SODA, SODIUM ACID PYROPHOSPHATE, MONOCALCIUM PHOSPHATE, SALT, WHEAT STARCH, NIACIN, REDUCED IRON, BHT PRESERVATIVE, TOCOPHEROL PRESERVATIVE, CITRIC ACID PRESERVATIVE, BHA PRESERVATIVE, TRICALCIUM PHOSPHATE, THIAMINE MONONITRATE, RIBOFLAVIN, FOLIC ACID, SILICON DIOXIDE. Besides, how difficult is it to whip up a batch of cornbread or corn meal muffins? Not difficult at all, and I do it all the time using my friend Lynne’s recipe, from Cook and Be Merry. I used this as a base for this cake. Moreover, how good will you feel not feeding that list of ingredients to your family? I also made another few changes: David’s recipe uses raw apples (I lightly steamed mine), cinnamon and nutmeg, which I omitted, probably because I’m from Britain. 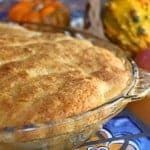 If you are American and cannot get your head around someone omitting cinnamon in a recipe, read this British Apple Pie recipe. ? However, feel free to add some spices if you like. Since there’s only a small amount of flour, feel free to substitute a gluten free baking mix. I’ve done this successfully, much to the excitement of friends on GF diets. This is a lovely loaf cake to make when you don’t want a super sweet type of dessert, or want a twist on cornbread. I think it’s a perfect afternoon snack for kids and adults, alike. Enjoy! Place the dry ingredients in a bowl and set aside. Next, pour the beaten eggs, melted butter and buttermilk into a large measuring jug. 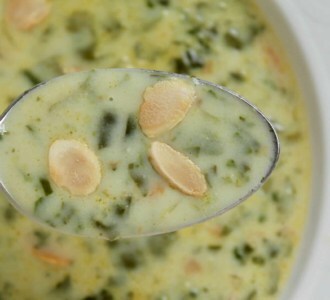 Stir well and pour the mixture into the dry ingredients. Whisk until everything is combined. 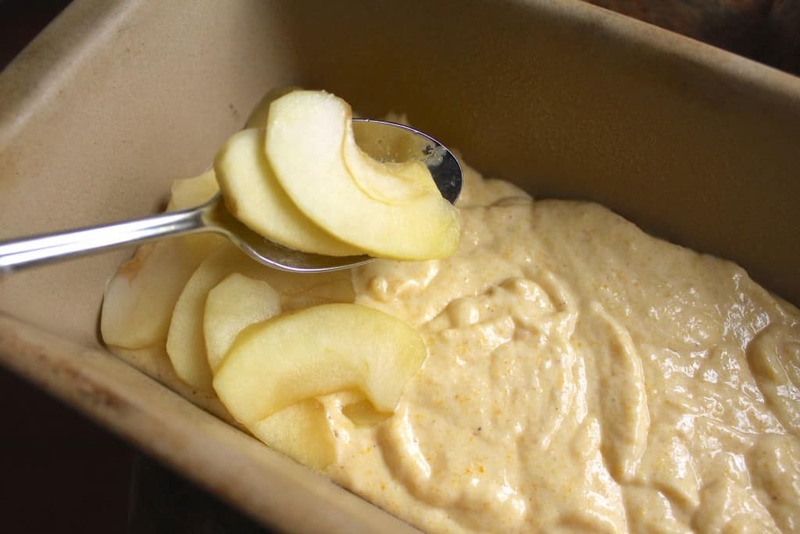 Now pour one third of the batter into a buttered loaf tin, then layer half of the apples on top. 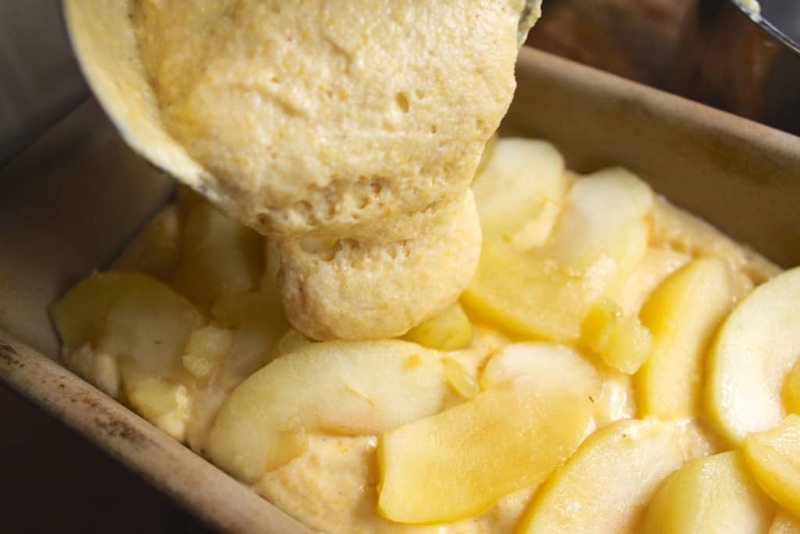 Next, put another third of the batter on top of the apples. Repeat another layer with the remaining apples. 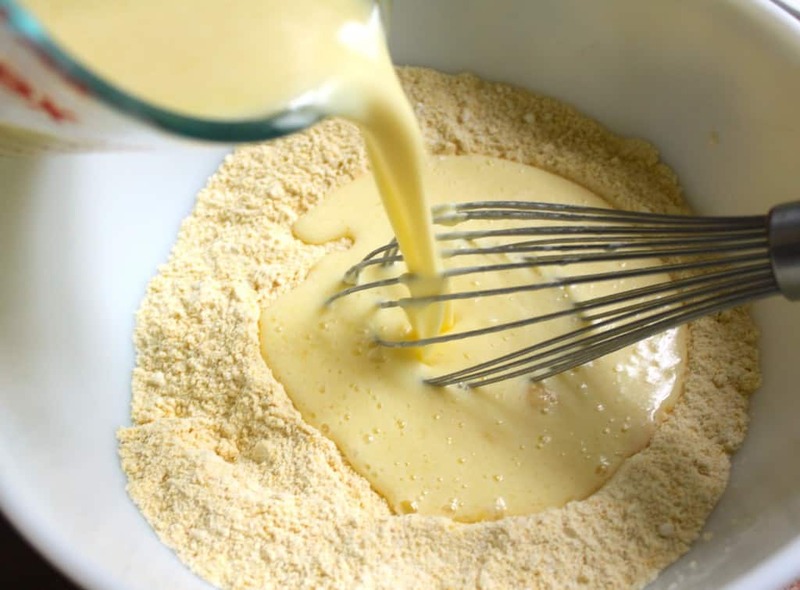 Finally, add the rest of the batter. 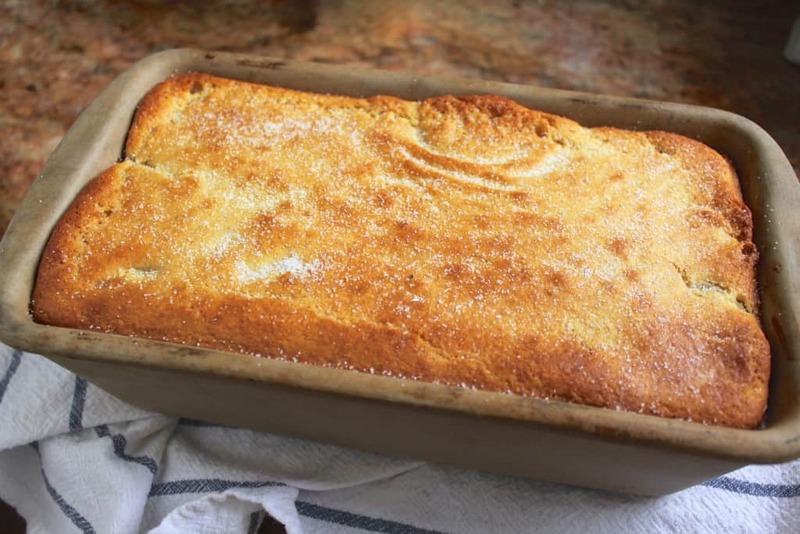 Place the loaf tin in the center of the preheated oven and make for 40-45 minutes or until a skewer inserted into the cornbread apple loaf, comes out clean. Next, sprinkle with a little sugar and allow to cool in pan about 30 minutes. After half an hour, remove the cornbread from the pan and place on a cooling rack. 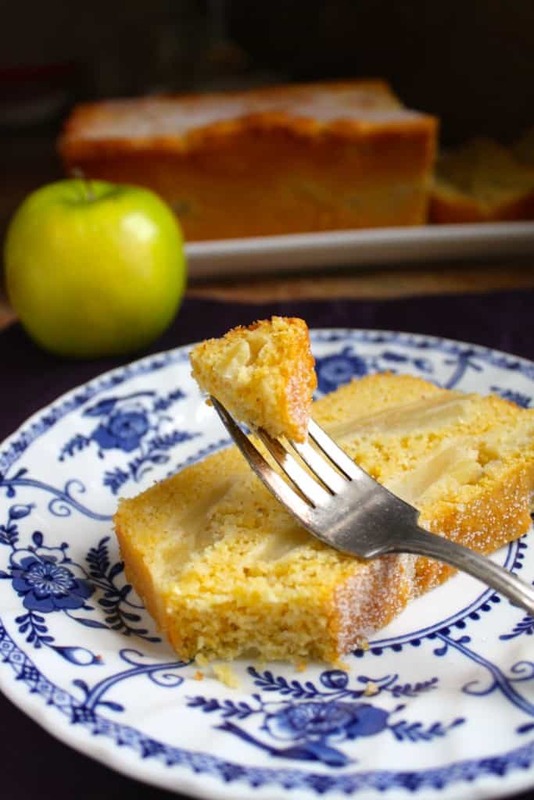 Serve this cornbread apple loaf with a hot beverage for a lovely afternoon treat. Sorry, but that’s a comment that should be directed to google, not me. As you can see in my tags, I used “vegetarian”, but not “vegan”. 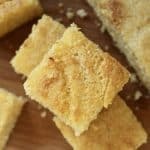 Such an easy and incredibly good corn bread recipe. Adding Apples was genius! 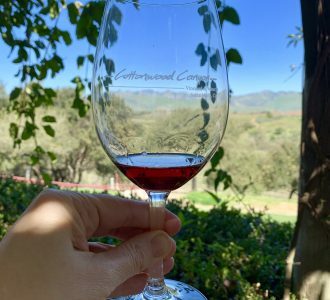 We loved it with dinner and then toasted the next morning with an omelet….so, so good! 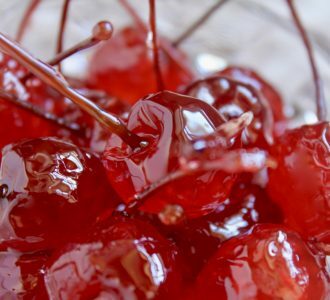 Love your recipes Christina, keep them coming! Made this and it turned out delicious! Making goodies from scratch is the only way to go. Some people can’t understand why I like to go to all the trouble…..then they taste what I’ve baked and they become believers!! That’s great to hear, Mary! However, you and I know that there really isn’t that much “trouble” to go to when making things from scratch, right? But what a difference in flavor?! Keep on baking! Just made this easy and delicious loaf, from scratch of course, very very good! Wonderful! Thank you for letting me (and others) know, Liz! Why make something from scratch when you can use a mix that is full of chemicals and other undisclosed horrors?? You and I are alike, Christine. NO MIXES EVER! I remember a friend wanted to make us pancakes but suddenly realized she was out of Bisquick. So Mark and I got out the flour, eggs, milk, sugar, butter, and baking powder, and our friend had the lightest and best pancakes she’d ever had. Now on to the important subject – your gorgeous Loaf! Can’t wait to try it. Just made a Tuscan ricotta and apple cake which was very nice. A good time for apple-y dishes!! Oh no, Bisquick!! Full of chemicals and preservatives! Glad you showed your friend what real pancakes taste like! 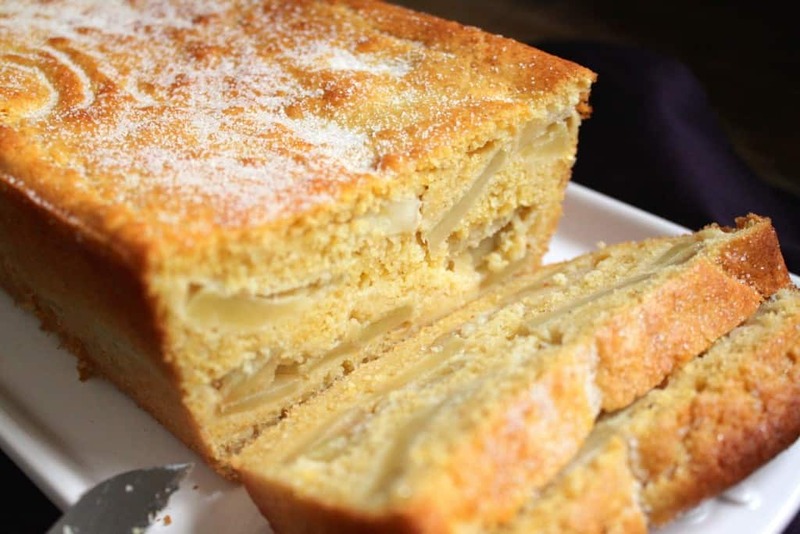 :) Ricotta and apple cake sounds wonderful! I have to come check out your latest recipes, I’m trying to get caught up from the last trip, but leaving for Scotland, soon! Eeek! 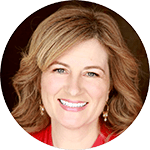 I’ve adopted this yellow baby, he looks so good..
Christina – this is so funny – I was looking at this lovely looking recipe of yours the other day and so I’m really glad you re-posted it, Christina, with grams and a reminder for me to make this. Kids will love it. I was making a kind of cornbread thing recently, even if savoury, and so we’ve been thinking on the same lines, even if yours is sweet. 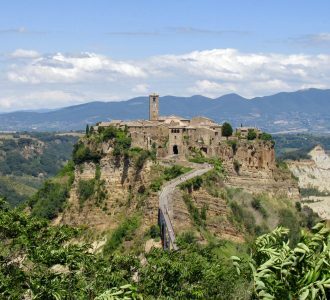 Absolutely love the look of this with apples for something a bit different – and Italian, of course! Looks fabulous. Why am I not surprised, Jill? ;) Nonna used to make a savory cornbread, and once I made cornbread without sugar and I disliked both! Has to be lightly sweetened for me. Let me know what you think if you try this one! This is my idea of a perfect recipe. 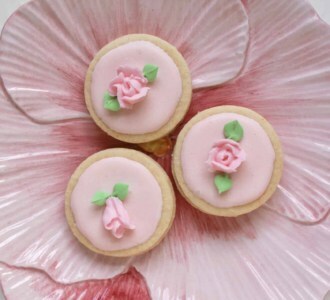 I can’t wait for the weather to cool down so I can bake this. Oh yes, needs to cool down considerably before any oven is turned on here in LA! Good grief! Looks and sounds delicious, I’m making this for next Sunday Church potluck, perfect posting time Christina, thank you for your wonderful posts, all so beautiful. 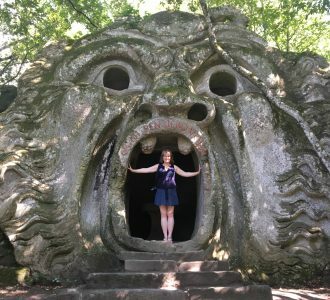 Hey Christina, it’s Serena from Foodiamo! 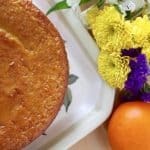 I was looking for a recipe for apple cake with cornmeal and stumbled into yours! I can’t tell you how badly I want this right now! It’s just lovely! Thank you, Valentina! It’s really easy to whip up on a whim, too! Your cake looks so delicious! 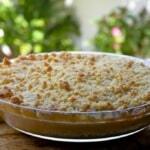 I’m really happy you like my cornbread recipe and could use it for this apple rendition. You have gotten my creative juices flowing. Thanks. I LOVE your recipe, Lynne! Haha! That’s pretty funny, but it’s hard for me to imagine you making anything close to that bad! This cake is gorgeous, Christina! I love the pretty apple slices and the cornmeal sounds wonderful in here! So delicious! The aroma is wonderful, Amanda! What an intriguing idea for a cake. I don’t like super sweet so this looks perfect to me. This is such a unique recipe, i can’t wait to try it, that texture is to die for!! Beautiful cake., love cornmeal/ Wonder how this would be with semolina as well. The cake looks gorgeous. Thanks, Suzanne! I bet it’s wonderful with semolina! Christina I LOVE this cornbread apple loaf. Like that you’ve reworked it from the box/mix and it does remind me of an Italian-like apple cake It’s rustic and made from scratch! I’m a cornbread addict. I can’t stop eating when it’s in front of me until it’s gone. i also love apples in my dessert, so I’ll be eating that whole loaf. alone. standing in the kitchen. hopefully with a knife and fork!